Although sawfish look somewhat like sharks, they are actually rays. They have an elongated snout or “rostrum” that is studded with teeth that they swing from side to side to stun schooling fishes, crustaceans and invertebrates upon which they feed. Large tooth sawfishes are most commonly encountered in estuaries and shallow bays (Wueringer, 2010; Wueringer et al. 2012). They can grow to over 20 feet long, and are readily distinguished from other sawfishes by the wider spacing of their rostral ‘teeth’ relative to other sawfish species. All species of sawfishes are highly endangered. They pose little threat to humans unless threatened or startled. 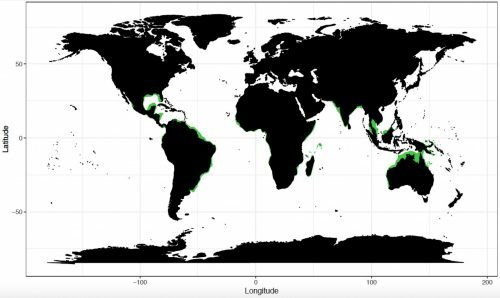 Recent molecular phylogenetic work (Faria et al., 2013).has shown that the previously recognized sawfish species P. microdon (Indo-West Pacific) and P. perotteti (Atlantic and East Pacific) constitute sub-populations on one globally distributed species Pristis pristis. 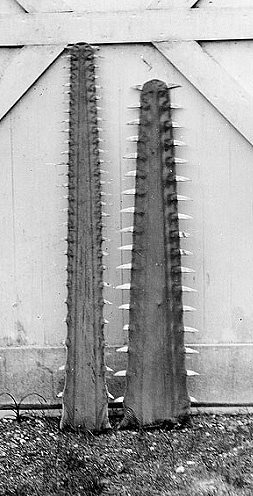 Sawfish saws have long been sold as trophies or curios. Historically sawfish saws have been used in religious rituals and traditional medicine (Charvet-Almeida, 1999, 2002; McDavitt and Charvet-Almeida, 2004). In parts of South East Asia the rostral teeth are hand crafted into tools or attached to the legs of birds used in cockfighting. Sawfish meat has been harvested for human consumption and is reported to be white and tender. Today, sawfish fins are more valuable than their meat and has been sold in the Asian ‘shark fin’ trade (Charvet-Almeida, 1999, 2002; McDavitt and Charvet-Almeida, 2004). Some cultures believe tea made from the saws aid in treating asthma. Unprovoked, the sawfish is considered very docile. Captured sawfish should be handled with care however, as their saw can be used for defense in powerful side-to-side motions. Sawfish occasionally get entangled in fishing nets as incidental bycatch. (Charvet-Almeida and Faria, 2008). They are usually associated with mangroves or seagrasses (Simpfendorfer, 2007; Moore, 2014), and as such are particularly susceptible to habitat degradation as more and more of these areas are degraded by human activity. Sawfishes have been protected by Florida law since 1992 when a ban on both commercial and recreational fishing was instituted. On April 1, 2003, the U.S. National Marine Fisheries Service placed the smalltooth sawfish (P. pectinata) on the Endangered Species list, making it the first marine fish species to receive protection under the Endangered Species Act (ESA). The petition placed on behalf of the largetooth sawfish was declined for lack of information about the species. Historical data however indicate that the largetooth sawfish was one common throughout the Gulf of Mexico. Recent research based on very few encounter records suggest that large tooth sawfishes may still exist in some parts of the Gulf of Mexico, all be they in very low numbers. 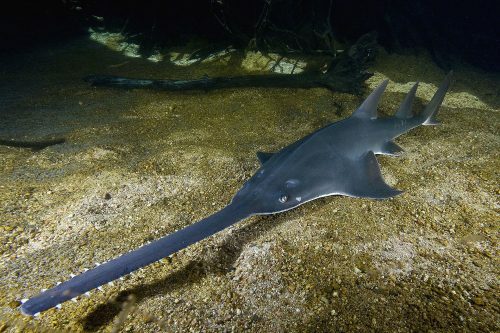 In March 2010, the largetooth sawfish was resubmitted for consideration as an “Endangered Species.” The review found the species to be in danger of extinction throughout its shrinking range and recommended it be listed as “Endangered”; However, despite the recommendation, it was not listed at that time. In the July 2011 Federal Register, the NMFS issued at final determination to list the largetooth as endangered under the Endangered Species Act. As of July 21, 2011, the largetooth sawfish is now officially listed as an endangered species under the Endangered Species Act of 1973. The International Union for the Conservation of Nature and Natural Resources (IUCN) declared the family Pristidae to be “among the most threatened elasmobranchs” in the world with the largetooth sawfish currently listed as “Critically Endangered”. In June 2007, the Convention on International Trade of Endangered Species (CITES) imposed sanctions for the protection of all sawfish species, making it internationally illegal to trade in sawfish, their rostra, or their fins. The only trade of sawfish currently permitted is trade of live sawfish for public aquariums from Australia, in extremely limited quantities. > Check the status of the largetooth sawfish at the IUCN website. 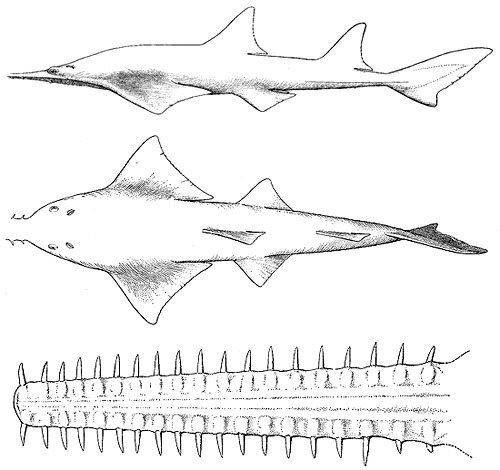 The largetooth sawfish (P. pristis) and its close relative the smalltooth sawfish (P. pectinata) are the only two sawfish species to be found in the western Atlantic Ocean (Bigelow and Schroeder, 1953). Both species once covered a wide range of habitats, stretching over the tropical and sub-tropical marine environments, as well as estuarine and contiguous freshwater habitats in the eastern Atlantic Ocean from the Caribbean to Central and South American as well as Africa. In the United States largetooth sawfish were reported to occur throughout the Gulf of Mexico primarily along the Texas and east Florida coastline, in warm shallow coastal habitats, more likely to be protected from the elements, such as lagoons or estuarine locations. However, migration accounts reported them as traveling as far North as New York, and certainly along the Atlantic coast to the Carolinas before their population declined. 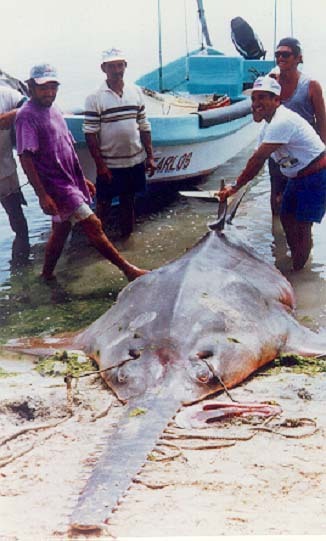 A sizeable population of freshwater largetooth sawfish also lived in Lake Nicaragua, although by 1981 these sawfish had been drastically depleted by overfishing. Today, the largetooth sawfish are believed to have been extirpated from Florida’s waters. Current reports of largetooth sawfish encounters in the Gulf of Mexico are rare, with only one recent (2017) record on the Texas coast close to the Louisiana line. Current Atlantic populations are believed to extend as far north as the southeastern United States. There are also occasional contemporary records from Central America, Northern Brazil and a few West African locations. Historically, largetooth Sawfishes ranged widely in western Atlantic tropical and subtropical marine, estuarine, and fresh waters, from Uruguay through the Caribbean and Central America, and seasonally to the United States’ Gulf of Mexico (Burgess et al. 2009, Faria et al. 2013). However subsequent to their decline they are now found reliably only in Central and South America freshwater and estuarine habitats. Historically Largetooth Sawfish were found in cooler waters of the eastern Pacific (Faria, 2012; Cook et al., 2005). The species once ranged from Mazatlán, Mexico to Peru (Chirichigno and Cornejo, 2001; Cook et al., 2005; Faria et al., 2013). The Indo-West Pacific Largetooth Sawfish population ranged from the Western Indian Ocean through India, the Bay of Bengal and Southeast Asia to New Guinea and northern Australia. However their present distribution is scattered across this range. Specimens have been documented in Papua New Guinea, Indonesia, Malaysia, Cambodia, Viet Nam and the Philippines (Roberts 1978, Tan and Lim 1998, Compagno et al. 2005, Stevens et al. 2005). Evidence suggests the species may already be extinct in South Africa, the Seychelles, and Thailand. Largetooth sawfish are doing reasonably well in Northern Australia compared to the rest of its range. They can be found in tropical northern Australia from Queensland, Cape York, the Gulf of Carpentaria, and the Northern Kimberley region. There are also documented occurrences of individuals migrating to southwestern Australia (Last and Stevens 2009). Sawfish inhabit the shallow coastal waters in tropical, subtropical and warm-temperate waters. They are typically found close to shore lying on muddy and sandy bottoms, in bays, estuaries, and lagoons. They rarely descend to depths greater than 33 feet (10 meters) (Carlson et al., 2014), although they have been found in water to 400 feet (122 meters) deep in Lake Nicaragua. Juveniles spend 4–5 years in freshwater before migrating to estuarine and marine waters (Thorburn et al., 2007; Peverell, 2008; Whitty et al., 2008; Whitty et al., 2009; Thorson, 1982). While they swim much like sharks, sawfish are actually a species of ray. The head is ventrally flattened with the mouth and gills located underneath and the eyes positioned dorsally. Sawfish are able to breathe while lying on the ocean floor by drawing water into their gills through large holes behind each eye, called spiracles. Their most distinctive feature is their long flat rostral “saw” – studded with rostral teeth along the margins. These “teeth” are set deeply in hard cartilage and do not grow back if the root becomes damaged. The largetooth sawfish and the smalltooth sawfish (P. pectinata) are similar in appearance with overlapping ranges in the western Atlantic Ocean and parts of the eastern Atlantic Ocean. The two species can usually be differentiated by the number of teeth on the rostrum. P. pristis have between 14-24 rostral teeth on one edge of the saw whereas P. pectinata usually have between 20 and 30 (Last et al., 2016). The two species can also be distinguished by the placement of their first dorsal fin. In P. pristis the first dorsal fin originates anterior to the pelvic fins while in P. pectinata the first dorsal fin originates at the anterior margin of the pelvic fins. The pectoral fins of P. pristis are proportionally larger than those of P. pectinata. Furthermore, only P. pristis has a distinct lower lobe on its caudal fin (Last et al., 2016). Largetooth sawfish can be easily distinguished from other sawfish by its size and rostral teeth count and orientation (See table) (Last et al., 2016). Comparison of smalltooth sawfish saw on left and largetooth sawfish saw on right. P. pristis caught in saltwater are dark gray to golden brown in color. Freshwater specimens are lighter gray with red coloration around the back, lower sides, second dorsal, pelvic fins, and caudal sides. The first dorsal may have pale yellow color with a reddish rear tip (Last et al., 2016). The buccal teeth of the largetooth sawfish are curved anteriorly with an obtuse cutting edge. The teeth are larger than those in the smalltooth sawfish, with about 12 functional rows in each jaw. The number of teeth increases as the sawfish matures. Newborn largetooth sawfish have 70 teeth and larger individuals have approximately 80-90. Dermal denticles of P. pristis are more widely spaced over the upper surface than in P. pectinata. The blades are ovoid in shape and rather strongly oblique. The bases are roughly four-cornered and are evident through the skin in very young specimens but more concealed in larger specimens (Deynat, 2005). Maximum size of P. perotteti has been reported between 20.0-21.2 feet(6.1-6.5 m) total length and between 1,102-1,323 pounds (500-600 kg) in weight. P. pristis are believed to mature around 10 feet (3 m) (Thorburn et al. 2007, Peverell 2008, Whitty et al. 2008; Last et al., 2016). Largetooth sawfish grow slowly, reaching maturity late at 10 years of age and producing few young. As a result, their population growth is extremely low. Although lifespan in the wild is unknown, research suggests this species lives roughly 35 years (Peverell 2008). Largetooth sawfish feed primarily on benthic crustaceans and other invertebrates it stirs up from the substrate with its saw. The saw may also be used to disable prey by stunning small schooling fish such as mullet and smaller herrings before consuming them (Last et al., 2016). P. pristis is ovoviviparous. It’s eggs are retained in the uterus and the embryos develop while being nourished by a yolk sac (Nunes et al. 2016). The young are fully developed at birth and litters consist of 1-13 young with 7-9 being the most frequent litter size (Last et al., 2016). Nicaraguan specimens have been recorded as 2.5 feet (76 cm) TL at birth (Thorson, 1976). Litters may be produced every other year. The mating season for the Lake Nicaragua population of largetooth sawfish is early June to July, gestation lasts approximately five months, with young born from October to December (Thorson, 1976). The saw teeth of young sawfish do not fully erupt, and are covered by a sheath of tissue until after birth to protect the mother during the birthing process. It has been reported that predators of the largetooth sawfish include the American crocodile (Crocodilus acutus). Sawfishes (Pristis spp.) have been preyed upon by narrowtooth sharks (Carcharhinus brachyurus), bull sharks (Carcharhinus leucas), and tiger sharks (Galeocerdo cuvier). Sawfishes may also fall victim to red tides. Red tides (Karenia brevis) occur in the Gulf of Mexico, along the Florida coast, and impact many species of fish and wildlife. The currently valid scientific name for the largetooth sawfish is Pristis pristis. Pristis perotteti (Müller & Henle, 1841, see Baughman 1943) and P. microdon Latham 1794 are synonyms (Faria et al., 2013). The genus name Pristis is derived from the Greek word “pristis” which means saw. Baughman, J.L. 1943. Notes on sawfish, Pristis perotteti Müller and Henle, not previously reported from the waters of the United States. Copeia, pp.43-48. Bigelow, H.B., Schroeder, W.C. 1953. Sawﬁshes, guitarﬁshes, skates and rays. In Fishes of the Western North Atlantic, Part two., Tee-Van J, Breder CM, Parr AE, Schroeder WC, Schultz LP (eds). Memoirs of Sears Foundation for Marine Research: Yale, University, New Haven; 1–514. Burgess, G.H., Carvalho, J.F., and Imhoff, J.L. 2009. An evaluation of the status of the largetooth sawfish, Pristis perotteti, based on historic and recent distribution and qualitative observations of abundance. Florida Museum of Natural History Report. Carlson, J. K., Ebert, D. A., Fordham, S. V., Bizzarro, J. J., Graham, R. T., Kulka, D. W., … & Dulvy, N. K. 2012. The Conservation Status of North American, Central American, and Caribbean Chondrichthyans. P. M. Kyne (Ed.). Vancouver: IUCN Species Survival Commission Shark Specialist Group. Carlson, J.K., Simpfendorfer, C.A. 2014. Recovery potential of smalltooth sawﬁsh, Pristis pectinata, in the United States determined using population viability models. Aquatic Conservation: Marine and Freshwater Ecosystems DOI:10.1002/aqc.2434. Charvet-Almeida, P. 1999. General information from sawﬁshes in Pará state, north Brazil. Boletim SBEEL 4: 12. Charvet-Almeida, P. 2002. Sawﬁsh trade in the north of Brazil. Shark News 14: 9. Charvet-Almeida, P., Faria, V. 2008. Pristis perotteti. In Livro Vermelho da Fauna Brasileira Ameaçada de Extinção (Série Biodiversidade), Machado ABM, Drummond GM, Paglia AP (eds). Belo Horizonte: Fundação Biodiversitas II; 33–35. Chirichigno, F. and Cornejo, U., 2001. Catálogo comentado de los peces marinos del Perú. Compagno, L.J.V. Last, P.R., Stevens, J.D. and Alava, M.N.R., 2005. Checklist of Philippine Chondrichthyes. CSIRO Marine Laboratories Report 243. G.H. Burgess, G.M. Cailliet, S.V. Fordham, R.D. Cavanagh, C.A. Simpfendorfer, and J.A. Musick (eds). Sharks, rays and chimaeras: the status of the chondrichthyan fishes, pp. 325-327. IUCN SSC Shark Specialist Group. IUCN, Gland, Switzerland and Cambridge, UK. Deynat, P.P. 2005. New data on the systematics and interrelationships of sawfishes (Elasmobranchii, Batoidea, Pristiformes). Journal of Fish Biology, 66(5), pp.1447-1458. Faria, V.V., McDavitt, M.T., Charvet, P., Wiley, T.R., Simpfendorfer, C.A. and Naylor, G.J. 2013. Species delineation and global population structure of Critically Endangered sawfishes (Pristidae). Zoological Journal of the Linnean Society, 167(1), pp.136-164. Last, P.R., and Stevens, J.D. 2009. Sharks and Rays of Australia. Second Edition. CSIRO Publishing, Collingwood, Australia. Moore, A.B.M. 2014. Sawﬁshes (Pristidae) in the Arabian region: history, diversity, distribution, and conservation. Aquatic Conservation: Marine and Freshwater Ecosystems DOI: 10.1002/aqc.2441. Peverell, S. C. 2008. Sawfish (Pristidae) of the Gulf of Carpentaria, Queensland, Australia. School of Marine Biology, James Cook University. Poulakis, G.R., Stevens, P.W., Timmers, A.A., Stafford, C.J., Simpfendorfer, C.A. 2013. Movements of juvenile endangered smalltooth sawﬁsh, Pristis pectinata, in an estuarine river system: use of non-main-stem river habitats and lagged responses to freshwater inﬂow-related changes. Environmental Biology of Fishes 96: 763–778. Roberts, T.R. 1978. An ichthyological survey of the Fly River in Papua New Guinea with descriptions of new species. Smithsonian Contributions to Zoology 281: 1–72. Simpfendorfer, C.A. 2007. The importance of mangroves as nursery habitat for smalltooth sawﬁsh (Pristis pectinata) in South Florida. Bulletin of Marine Science 80: 933–934. Stevens, J.D., Pillans, R.D. and Salini, J. 2005. Conservation assessment of Glyphis sp. A (speartooth shark), Glyphis sp. C (northern river shark), Pristis microdon (freshwater sawfish) and Pristis zijsron (green sawfish). Final Report to the Department of the Environment and Heritage. Tan, H.H. and Lim, K.K.P. 1998. Freshwater elasmobranchs from the Batang Hari Basin of Central Sumatra, Indonesia. Raffles Bulletin of Zoology 46: 425-429. Thorburn, D.C., Morgan, D.L., Rowland, A.J. and Gill, H.S. 2007. Freshwater sawfish Pristis microdon Latham, 1794 (Chondrichthyes: Pristidae) in the Kimberley region of Western Australia. Zootaxa 1471: 27–41. Thorson, T.B. 1976. Observations on the reproduction of the sawfish, Pristis perotteti, in Lake Nicaragua, with recommendations for its conservation. In: T.B. Thorson (ed.) Investigations of the ichthyofauna of Nicaraguan lakes, pp. 641-650. University of Nebraska-Lincoln. Whitty, J.M., Morgan, D.L., Peverell, S.C., Thorburn, D.C. and Beatty, S.J. 2009. Ontogenetic depth partitioning by juvenile freshwater sawfish (Pristis microdon: Prstidae) in a riverine environment. Marine and Freshwater Research 60: 306–316. Whitty, J.M., Phillips, N.M., Morgan, D.L., Chaplin, J.A., Thorburn, D.C. and Peverell, S.C. 2008. Habitat associations of Freshwater Sawfish (Pristis microdon) and Northern River Sharks (Glyphis sp. C): including genetic analysis of P. microdon across northern Australia. Report to Department of the Environment, Water, Heritage and the Arts. Centre for Fish and Fisheries Research, Murdoch University. Wueringer, B.E., Squire Jr, L., Kajiura, S.M., Hart, N.S. and Collin, S.P. 2012. The function of the sawfish’s saw. Current Biology, 22(5), pp.R150-R151. Wueringer, B. 2010. The sensory biology and feeding behavior of sawfish.